WE BRING THE BAND. YOU BRING THE ROCKSTARS. Book the ultimate party experience for your next company party, retirement party, team building event, holiday party, or wedding. 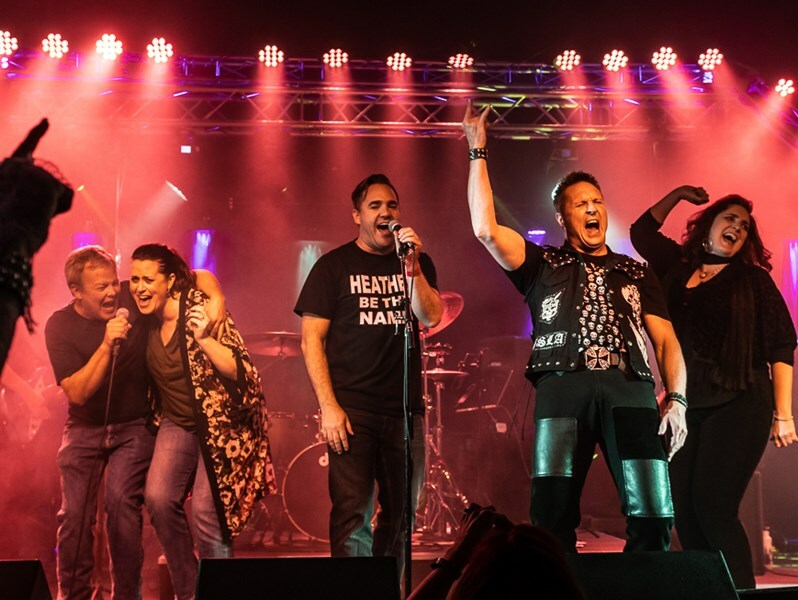 We are the nation's best live karaoke and professional dance band, and we want to jam with you! Let them lead the band. Fronting a band is a “peak performance” experience that transforms not just the moment but improves creativity, confidence, productivity and personal development over the long term. We've seen many times how finding the guts needed to own the stage energizes and empowers the rest of life. We've also seen how friendships and teams grow stronger when people support and encourage each other through intimidating experiences. Book the most memorable event of your company's history – one where your team looks fear in the eye, cheers each other on, and learns to fly! 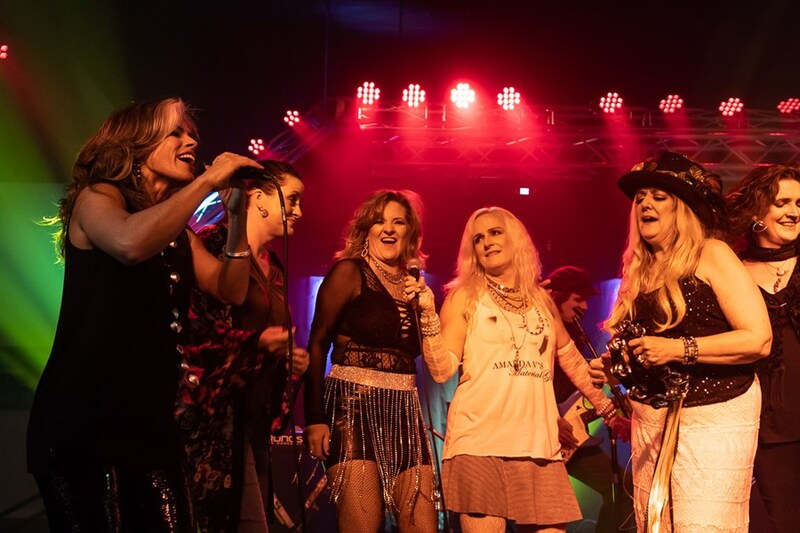 We bring the pro sound, the concert lighting, the professional musicians, the backup singers, the extra guitar and keyboard rigs, the laminated backstage passes… and the magic. You bring the lead singers. Have them look at our song list a month in advance. If they'd like to sing something not on the list, no problem! Just let us know – we'll learn up to 20 special requests. And if they'd like to come rehearse with us, even better! But it's also fine to show up to the party and just pick songs off our large menu! And when your team is busy buying each other shots, our professional vocalists will take over with the hottest dance tunes to keep the party going. - We love being the backing band for vocalists of all experience levels! - We have an extensive song list to choose from, but also accept requests in advance. And not just one or two per show… up to twenty. - We welcome clients at rehearsals. - We welcome client guitarists and keyboardists to join us on stage. We'll have an extra guitar rig and keys rig set up for them. - We welcome non-musicians, too – we have tambourines and shakers handy! 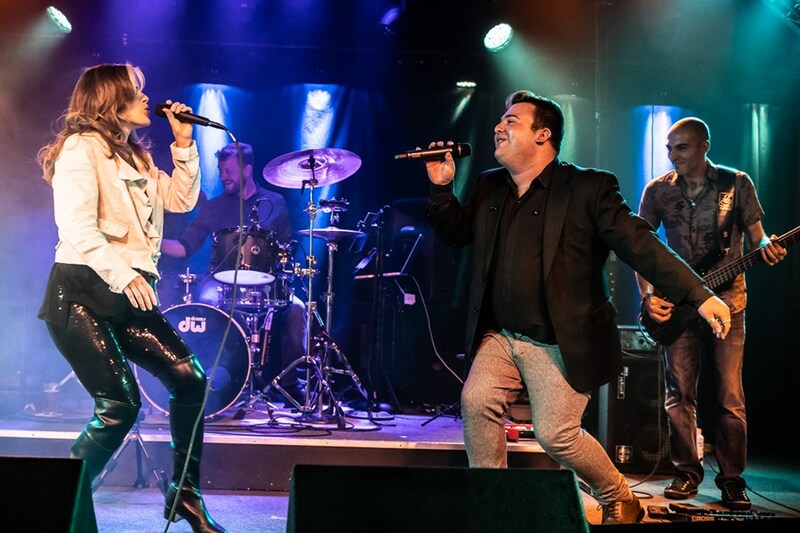 We combine our years of experience in top-notch corporate dance bands, vocal student showcases, live karaoke bands, and major-label touring to create a band unlike any other. We're used to learning even obscure songs quickly, and our experience working in and managing corporate and wedding bands gives us the deep repertoire of rock and dance standards you expect, as well as the professional polish to live up to your high standards. Please note The Legend Makers will also travel to Lakewood, Aurora, Englewood, Wheat Ridge, Westminster, Dupont, Commerce City, Arvada, Littleton, Broomfield, Golden, Eastlake, Henderson, Highlands Ranch, Morrison, Idledale, Indian Hills, Kittredge, Louisville, Lafayette, Louviers, Brighton, Evergreen, Parker, Boulder, Eldorado Springs, Watkins, Erie, Dacono, Conifer.